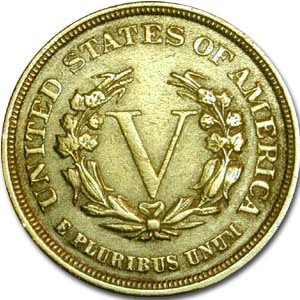 In 1883 the Mint issued a new 5c coin with the head of Liberty and a Roman “V” meaning “5” on the reverse. Many people thought that the coin was an error since in didn’t have “cents” anywhere on the coin. The lack of the word cents created an opportunity for the unscrupulous. The coins were gold plated and reeds were cut into the edge by hand (nickels have a plain edge) and they were passed off as $5 gold coins. The most famous criminal case about altered 5 cent coins involved a deaf mute named Josh Tatum. He would go to cigar stands and purchase a 5c cigar and pay with a gold plated, hand reeded nickel. The attendant would assume that it was a $5 gold piece and give Josh $4.95 change. He was acquitted since he never said that the coin was $5, he couldn’t. The Mint learned its lesson and later that year put the word “cents” at the bottom of the reverse. Some of these “Racketeer” nickels survive today and are interesting to collectors. Over the last century, there are many nickels that have been gilt and passed off as the “real” thing so beware of “copies”. Its not easy to ascertain whether you have a “genuine” racketeer nickel as they are all altered coins tampered with outside the Mint. Generally, the ones used in 1883 have some or all of the gilt rubbed off and have a very carefully reeded edge.